April 16, 2015--One of my cousins recently posted on our family Facebook page that our ancestor, Jean (John) Côté, one of the founding fathers of Quebec City (originally from the Region of Perche, France), has a coat of arms. He also sent along an interpretation of the emblem, describing what each segment stands for. I love the design and have decided to do it in needlepoint. If there are other Côtés out there with family from Quebec, we probably share the same ancestry. When my sister visited Quebec in 1970, she found 17 pages of Côtés in the phone book, so we have a very, very large family, both here in the U.S. and in Canada. 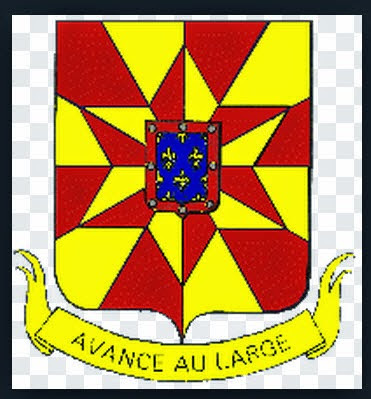 I understand Avance Au Large is loosely translated to mean "Advance--Go Forward".